I love using the fresh produce from my garden wherever I can and when I had the opportunity to use some of my beautiful beetroot I couldn’t resist! This is a classy salad perfect for a dinner party of formal meal. I really recommend not skipping on any ingredient. That being said you could cut the arugula into fine strips if you find the taste too strong. You can also buy your beets pre-cooked to save some time but they really are delicious when you roast them. If you have feta cheese in your fridge that makes a great substitute for goat cheese. Honestly this is a very delicious salad and all the flavors come together so well in what can only be described as a sophisticated salad. After eating it one of my guests suggested it was so yummy and filling that I could have used it as the main! Preheat your oven to 450 F and line a baking tray with aluminium foil. Using a whisk mix the vinegar, shallots and honey in a bowl while slowly adding in the oil. Coat the beats with the dressing by tossing them in a small bowl. Place the beets on a tray and roast them until they are caramelized. In my oven this took about ten minutes. Rotate them after 5 minutes so they are evenly cooked. Take them out when done and let them cool down. 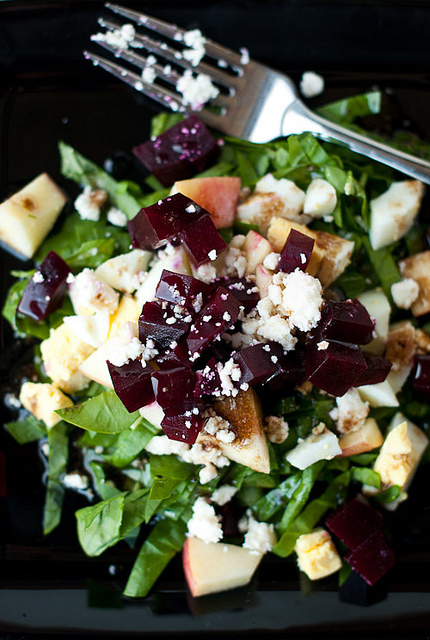 Toss the arugula, yummy cranberries and walnuts in your salad bowl and cover with the dressing. Add some salt and pepper according to taste. Place the salad on the plate and arrange the beets around the outside of your salad.